When I destroyed my credit and fell deep into debt in 2008, I thought the only way out would be bankruptcy. I owed tens of thousands on credit cards and home mortgages from rental properties. Part of the problem, besides those high rates that made the debt impossible to pay off, was just the fact that I was juggling so many different bills. Over a year, I missed a few payments just because I forgot what was due and when. One resource helped me to get out of this debt nightmare. It helped me put most of my debts into one bill as well as lower the rate and my monthly payments. It was a debt consolidation loan. By lowering my rate to 14% from 26% on nearly $20,000 of credit card debt, I lowered my monthly payment by $150 and saved almost ten grand in interest. It also made it easier to manage all my bills with just one monthly payment. I’ve reviewed debt consolidation here on the blog and always recommend taking your time deciding on any loan but there’s one very important reason you need to make a decision soon. That consolidation loan is about to get much more expensive. Debt consolidation is just a technical term for getting a loan to pay off your other debts. You’re ‘consolidating’ your other debt into one loan. Consolidation loans can come from a lot of sources including personal loans, p2p loans, home equity loans and even refinancing your car. The only requirement is that the loan you get has to be a lower interest rate than you’re paying on your other debt. This is why debt consolidation is often used to pay off high-interest credit card debt. The average rate on credit cards is 24% and some cards charge as much as 36% annually. Like most loans, interest rates for consolidation loans depend on your credit score and the amount you’re borrowing but there’s also another very important way they’re determined. The government has a hand in determining the interest rate on all loans. How Does the Fed Affect Debt Consolidation? I was an investment analyst for nearly a decade and one of the most important indicators I followed was interest rates. This ‘cost of money’ is a prime gauge for where stocks are going and loan rates. You see, the Federal Reserve (FOMC) controls interest rates by setting the interest rate for banks when they borrow from each other. You’ll hear this rate called the Fed Funds Rate or just the benchmark rate sometimes. The Fed increases or decreases this rate to either slow down inflation which happens when money is cheap or to spur employment when the economy slows down. By changing that base interest rate, most other rates for mortgages, credit cards and other loans change in the same direction. And the Fed actually tells us when it is going to increase or decrease interest rates. 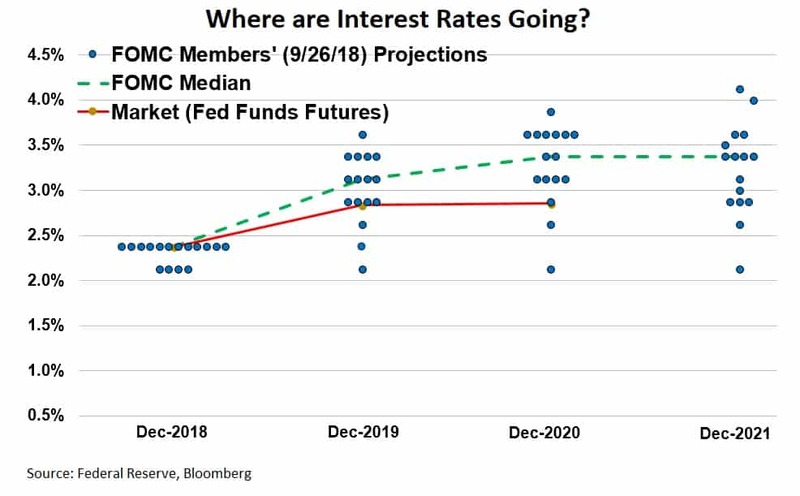 The chart below is of the Fed ‘Dot Plot’, the where the voting members of the Federal Reserve see interest rates up to three years into the future. Sorry, it got a little nerdy there. OK, you don’t have to be able to read economist to understand that interest rates are going up. The chart shows that the members of the Fed expect to increase the base rate from about 2.25% in 2018 to over 3% next year and almost 3.5% in 2020. That means interest rates on longer-term loans could go up as much as 2.5% to 3% over the next year. How Much Will Debt Consolidate Cost Next Year? The Fed is expected to raise rates in December and at least three times in 2019. That increase of 1% on the Fed Funds Rate might not seem like much but it will mean a big jump in other loan rates and could make loans unaffordable for a lot of borrowers. Let’s look at an example debt consolidation to show just how expensive loans could get. A $10,000 consolidation loan at 14% will cost $232.68 to pay off over 60 months. That same loan but at a 17% rate, just 3% higher, would cost $248.53 a month. That’s a small loan and you’re already paying $190 extra a year in interest if rates increase. Those payments on the more expensive loan would add up to $14,911 over five years, nearly 50% more than what you borrowed and over $1,000 more than the lower-rate loan. Not only will higher rates make debt consolidation more expensive but they could keep you from getting approved at all. Lenders take loan affordability into account when deciding on applications. 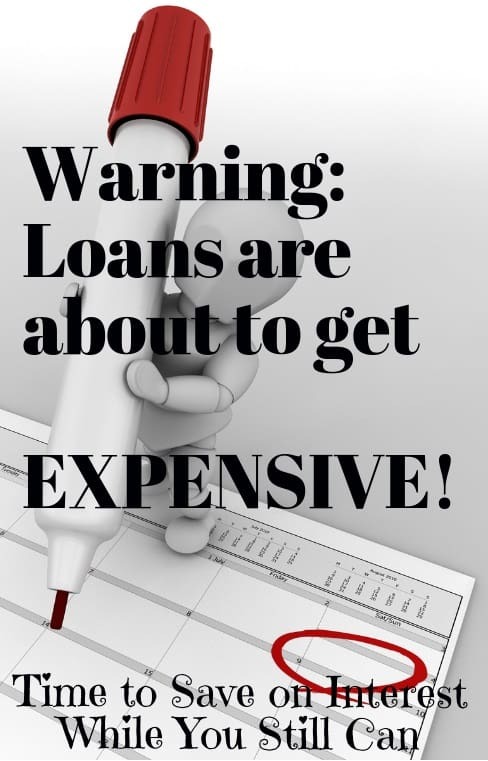 If they don’t think you can cover the higher payments, you won’t get the loan. Debt consolidation is a controversial strategy for paying off debt and I don’t want you to feel rushed into taking a loan. You need to sit down and think about how you’re going to get out of debt and understand the pros and cons of every strategy. Using a debt consolidation loan helped me save money on interest rates plus made it easier to manage my bills by putting them all into one loan. It helped increase my credit score by switching my debt from credit cards to a fixed-rate, fixed-payment loan. If you do decide to get a consolidation loan, I’ve reviewed the peer-to-peer loan sites and the process for getting a loan but it’s pretty straight forward. Take a hard look at your budget and spending. This has to be the first thing you do. Using debt consolidation to pay off your credit cards does no good if you keep overspending your budget. List your debts by interest rate and amount. This is important because you might not want to consolidate all your debts, only the ones with a rate higher than the loan. Apply for a loan on at least two sites. It won’t affect your credit score and you’ll make sure you get the lowest rate available. I recommend PersonalLoans and Upstart, two loan sites I’ve used. Borrow only as much as you need to pay off your debt. This isn’t an excuse to go out shopping. Make monthly payments and pay extra when you can. This will help pay the loan off early and increase your credit score for lower rates in the future. If you’ve ever thought about a debt consolidation loan, now is the time to make a decision. You should never feel rushed into taking a loan but interest rates will be increasing over the next year. As the Fed raises rates, the rate on all other loans will increase. That’s going to make a consolidation loan more expensive and harder to get approved.